As simulation techniques become more popular among the financial community and a variety of sub-industries, a thorough understanding of theory and implementation is critical for practitioners involved in portfolio management, risk management, pricing, and capital budgeting. Financial Simulation Modeling in Excel contains the information you need to make the most informed decisions possible in your professional endeavors. Financial Simulation Modeling in Excel contains a practical, hands-on approach to learning complex financial simulation methodologies using Excel and VBA as a medium. Crafted in an easy to understand format, this book is suitable for anyone with a basic understanding of finance and Excel. Filled with in-depth insights and expert advice, each chapter takes you through the theory behind a simulation topic and the implementation of that same topic in Excel/VBA in a step-by-step manner. 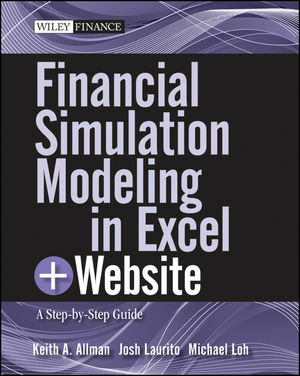 Created for those with some background in finance and experience in Excel, this reliable resource shows you how to effectively perform sound financial simulation modeling, even if you've yet to do extensive modeling up to this point in your professional or academic career. Keith A. Allman is an investment manager at Bamboo Finance, a private equity fund that invests in for-profit, commercially viable companies that provide a good or service that beneficially impacts the lives of low-income individuals. Previously, he was the director of analytics and modeling at Pearl Street Capital Group. Allman also founded Enstruct, which services clients worldwide in capital markets and equity valuation, distressed valuation, and quantitative-based training. He is the author of the Wiley titles Corporate Valuation Modeling, Modeling Structured Finance Cash Flows with Microsoft® Excel®, and Reverse Engineering Deals on Wall Street with Microsoft® Excel®. Allman holds bachelor degrees from UCLA and a master's degree from Columbia University. Josh Laurito, CFA, is a co-founder and Principal of Lumesis, a leading provider of credit analysis software and solutions to the municipal finance market. In addition, he directs corporate modeling for Hexagon Securities, a boutique merchant bank that advises and invests in banks and specialty finance companies.